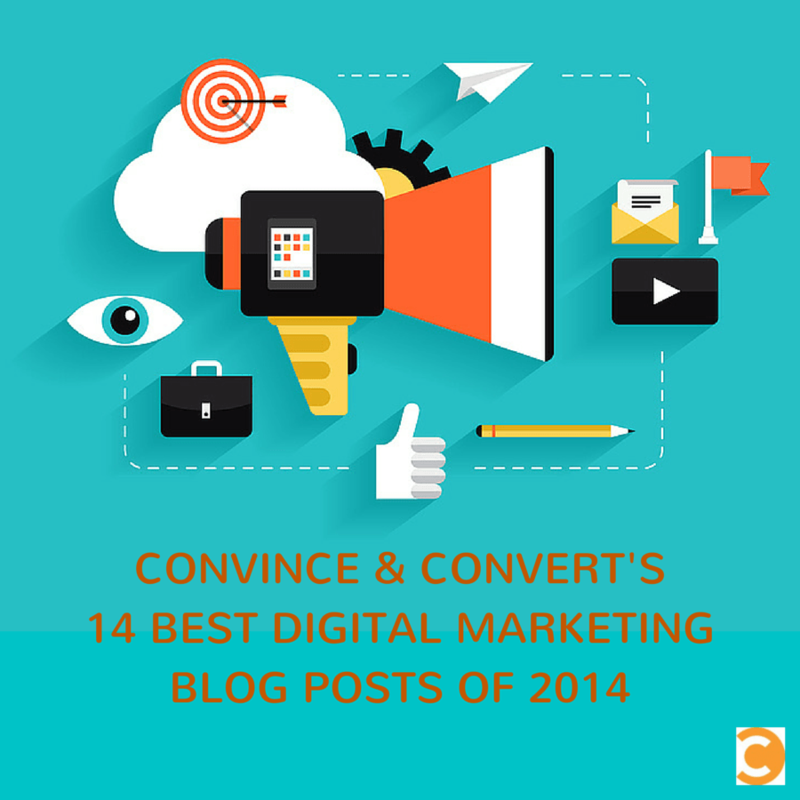 We published 372 posts here at Convince & Convert in 2014, and these are the 14 most popular. When we started this analysis, we figured there would be some killer posts, but it’s amazing how neatly these correlate to the big digital marketing trends of the past year. These 14 popular posts neatly encapsulate what businesses need to do to improve their digital marketing, in 2015 and beyond. Enjoy! We spend so much time worrying about the next shiny tool or best practice that sometimes we forget that marketing doesn’t have to be rocket science. These marketing changes are so easy to make that you might find yourself scratching your head wondering why you hadn’t thought of making them yet. This comprehensive post from Pratik Dholakiya tells you exactly what to change, why you should change it, and the tools you can use to help. In April, reports of Facebook’s declining organic reach made some marketers’ fears come true. Jay breaks down the business reasons why this happened and four suggestions to grow your social media presence despite Facebook’s changing strategy. LinkedIn announced a new publishing platform this year, which initially was only open to specific influential users. As they began to roll the tool out to more general LinkedIn users, the question arose: How do we best use this new content marketing platform? Greg Ciotti of Helpscout takes us through his experience and key learning from publishing his previously written content on LinkedIn. 11. Do Social Signals Drive SEO? As Jay recently reminded us in a Jay Today episode, SEO is not dead. Not even close. And because social media has driven the marketing strategies of many businesses for several years now, is it possible that social signals have an effect on search rankings? Eric Enge breaks down the truth about social media and SEO. Content marketing isn’t a “nice to have”. It’s a requirement. We’ve been preaching about helpful content here at Convince & Convert for years, and 2014 was certainly the year that the term “content marketing” began to stand on its own. Here are Jay’s seven elements that every great content strategy must have to succeed. Even Google is letting its users know that helpful content is king. When it introduced its “Social” and “Promotions” tabs, email marketers panicked. That’s because emails were no longer guaranteed to show up in a Gmail user’s primary inbox, and for many marketers, Gmail was one of their largest subscriber clients. Luke Guy took a look at successful email marketing campaigns from some of our favorite marketers, including Pat Flynn and Michael Hyatt, and put together this case study on how to better your chances of being seen by your Gmail subscribers. Putting content out into the world isn’t necessarily helping if you’re not able to reach anyone. This post from Gini Dietrich is chock full of ideas that can not only garner more eyeballs for your content, but also get your wheels turning on some new content development strategies. With visual marketing on the rise, YouTube has taken a front-and-center position in the minds of marketers this year. Video is a powerful storytelling tool, and advertising is a popular revenue-generating tool. Together, these marketing techniques can both build trust among your audience and convert views into dollars. Brian Carter explains the power of YouTube advertising and offers some examples of how it makes a difference. Julie Neumark has made the connection between successful TED Talks and amazing content marketing. After all, content marketing is all about combining helpful information with great storytelling. Watch Nancy Duarte, JJ Abrams, and Andrew Stanton enlighten audiences and think about how you can tell better stories through your own content. Just because you joined Facebook when you were in college doesn’t mean you know how to be a social media marketers. Writing and communications are important, but so is pattern recognition and data analysis. Take a tip from Jay and start developing these six important skills, especially if you want to excel in your social media career. We love that everyone is creating content. We really do. But with all the digital marketing musings floating around the internet, it’s difficult to know what’s worth reading. This list of 33 digital marketing blogs has been carefully curated by Jay, so you know that you’re getting the good stuff. The problem with social media is that it does not offer any reliable reach statistics. Even if you have a million fans on Facebook or 20,000 followers on Twitter, there are no guarantees that all of those people will see your content. As a result, it’s time to send more targeted messages in more places. As Jay says, shotguns trump rifles. You need to consider which platforms are working and become a digital dandelion – reaching people consistently where they want to be reached. A story about Snapchat in the top of our list? Believe it or not, Snapchat is becoming a viable marketing tool, and this relatively new platform is still a mystery to many digital marketers. Our resident visual marketing expert Jessica Gioglio explains how five popular brands are using Snapchat to reach its fans in a timely, interesting, and snackable fashion. Buffer has established itself as a trusted social media publishing tool with great reporting and analytics. Since launching Buffer for Business this year, co-founder Leo Widrich has gleaned several insights about social media usage and best practices. These specific and strategic recommendations are backed by data and can be applied to any brand, large or small. 2014 was all about content, specifically helpful, short-form, and visual content. What will 2015 bring?